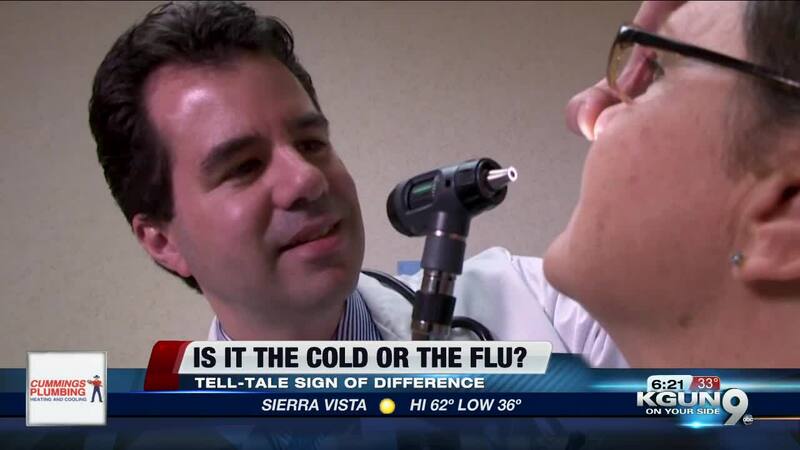 Consumer Reports: Is it a cold or the flu? While the flu season is well underway, the CDC says it's still not too late to get vaccinated. But how do you really know if you have the flu or just a nasty cold? Consumer Reports breaks down the differences with one tell-tale sign to look out for. Nasty colds are never fun, but the flu can be much more serious. So how do you tell the difference? Consumer Reports says there's one sure thing to look for. "It hits you like a ton of bricks. Comes on so fast. It can come on in a few hours," says Consumer Reports Health Editor, Ellen Kunes. And you'll likely have these added symptoms: Feeling feverish or having a fever, chills, muscle aches and extreme tiredness. A cold has similar but milder symptoms: Runny or stuffy nose, cough, sore throat, fatigue. But there's a difference. "It's still bearable. You can still go to work and have a cold," says Kunes. "With the flu you really can't. You want to go to bed. You just feel like you can't move." So what should you do if you suspect you have the flu? Consumer Reports says you may want to call your doctor and see if you're a candidate for anti-viral medicine, like Tamiflu or the new antiviral on the market, Xofluza. Both work best if taken within 24 to 48 hours of getting symptoms and may shorten the duration of the flu by one to two days. But Xofluza only requires one dose, where Tamiflu requires you take it twice a day for five days. And if you do have the flu? "Do everyone a favor and call in sick," says Kunes. Keep in mind both flu medicines are expensive. With a coupon, Tamiflu will cost you about $50, while Xofluza will run about $30 based on what your insurance company covers.